Favorite started out in 1986 with a commitment to bring great taste, value and service to it's customers and those good old-fashioned principles are still at the centre of everything we do. Favorite is a family business, as are the majority of our franchise stores, we greatly appreciate your custom and when you dine with us you're helping support British business and your local economy. We believe great quality freshly prepared ingredients are at the centre of great taste. 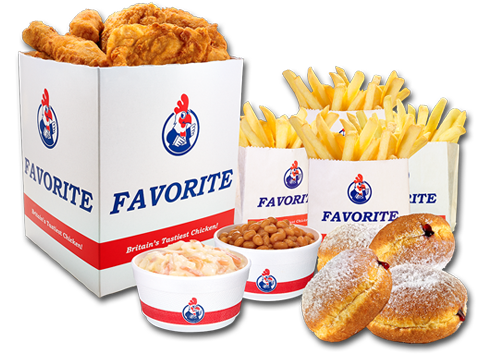 Favorite Traditional Chicken pieces are prepared and cooked in store using only top quality fresh chicken from reliable approved suppliers. Our Chicken Fillet Burgers, whether it’s Traditional, Fillet of Fire or Double Ringer, are just that – all tender chicken breast hand prepared and cooked the way only Favorite can. The same for our Crispy Fillet Strips & Chicken Poppas, whole pieces of chicken breast, not minced, not processed, just natural succulent chicken. Favorite Fries are pure potato, blanched in sunflower oil and all Favorite cooking oils are free from harmful trans fats. In 1998 Favorite was the first UK food chain to declare a "GM Free Zone". At Favorite we love food and enjoying great tasting food is one of life’s greatest pleasures. Whether you’re treating yourself to lunch, are out for the evening or sharing a night in with family and friends, Favorite has something for everyone to enjoy. Our franchisees mainly live locally, they’re a part of the community and our stores are local businesses and employ local people. They greatly appreciate your custom and every time you enjoy a meal at Favorite you are helping to support British business and your local economy.